PreS-Gr 1– "Henry’s puppy, Mudge, likes a lot of things. He likes playing with his chew toys, eating crackers, drooling, and living with Henry. But, most of all, he likes cats, especially his new friend Fluffy. Mudge and Fluffy play chase around the yard and hide and seek in the living room. When they’re finished playing, they rest together—Fluffy purring and Mudge snoring. 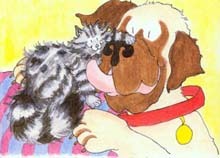 The “Puppy Mudge” titles are geared toward a younger audience than the Henry and Mudge original easy readers. Beginning readers will appreciate the large font size and repetitive, simple text (Simon Spotlight, 2004). Large, bright illustrations by Sucie Stevenson complement the story. The audio recording is enhanced with background sounds such as squeaky toy noises, dogs panting and barking, and drool dripping. Suzanne Toren’s clear and well-paced narration gives students adequate time to follow along with the text. A great way to introduce the youngest readers to Rylant’s classic characters." (Editors' Note: The following is a combined review of PUPPY MUDGE FINDS A FRIEND and PUPPY MUDGE WANTS TO PLAY.] --"Young listeners have the pleasure of sharing the adventures of Rylant's beloved Henry and his faithful St. Bernard, Mudge, in his puppy years. In PUPPY MUDGE FINDS A FRIEND, Mudge playfully torments a cat buddy. In PUPPY MUDGE WANTS TO PLAY, he desperately tries to get Henry's attention for a good romp. Suzanne Toren narrates with gentle voice, leisurely pace, and frequent pauses that enable youngsters to turn pages and to savor Stevenson's signature illustrations. Toren's voice is clear and strong. She excels in portraying a disgruntled but loving Henry as he responds to Mudge's pestering. Music and sound effects provide an animal-friendly background of panting, mewing, and drooling, as well as crumbling crackers and thumping footsteps."